So I have a new addiction. Carrots. It's a great addiction and I'm excited about it. I came across a recipe that baked carrots and zucchini with salt and pepper and it was supposed to be awesome. It sure was. 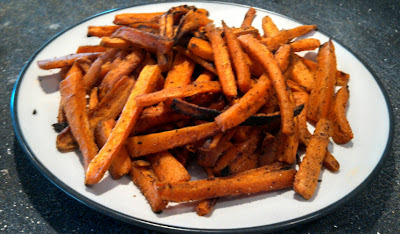 I love sweet potato fries, but I know I really shouldn't eat a ton of them. I don't want to stray too far from Paleo by stuffing myself with them. But now with my carrot fries I don't have to feel guilty for eating a whole pan of them. (I've had them 3 times for a snack in 1 week...they are goooood). So here is what I did. I like spicy and salty...so if you don't, just alter the amount of pepper or change the seasonings. 3. Place foil onto baking sheet and coat pan and carrots in coconut oil. 4. Sprinkle seasonings over top. 6. Let cool. Taste. Re-season. Eat. Yum. Best thing is...they are carrots.